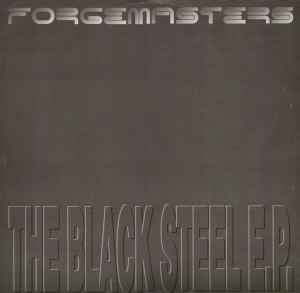 Forgemasters ‎– The Black Steel E.P. A i: recorded and mixed at Fon. A ii: recorded and mixed at Home. B i: recorded at Fon remixed at Western Works. B ii: Recorded at Fon. ℗ & © Network Records 1991. "Clap" contains a vocal sample from Hercules - "Lost In The Groove"
It's all about 'Stress' and 'Track With No Name (Communique Mix)'. Serious bleeps and bass heat! Am I seriously the first person to comment on this? I won't waste my time typing. Just listen to the tracks on YT. Seminal UK techno. Nuff said.